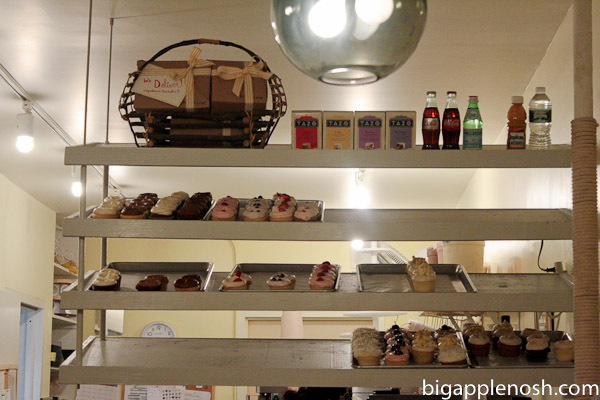 … and decided on one of the specials – The Elvis (first cupcake in first photo). A banana cupcake with peanut butter frosting, The Elvis was dense, soft and flavorful (I’m talking about the cupcake here, though I guess the same might have been said about THE Elvis). The peanut butter frosting had heft but didn’t overpower the light banana flavor of the cake. This morsel of deliciousness was gone pronto. 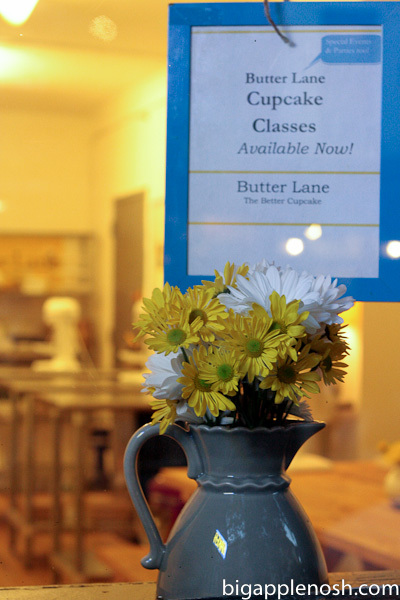 If you’re in the East Village, pop into Butter Lane for a quick cupcake fix in a quaint and cozy shop. You won’t regret it! Find them on Twitter or Facebook! 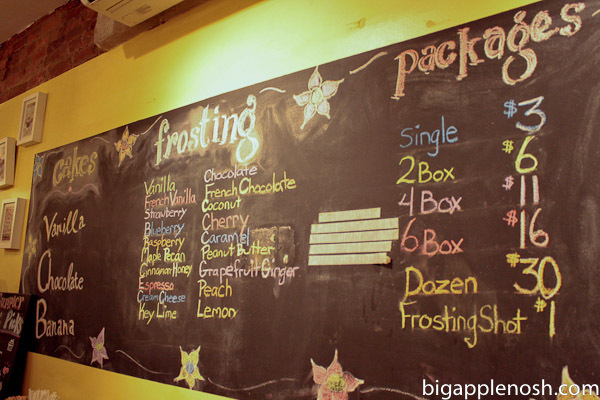 Tell me – what cake/frosting combo from the menu would you go for? Ooh, I'm curious, what is a FROSTING SHOT?! Whatever it is, it sounds delicious. As does the Elvis cupcake. omg cupcakes!! I wish we had more cupcake stores here I love stopping by and having a good cupcake now and then instead of having to make them. You picked the combo I would have! Can't ever go wrong with Banana and Peanut Butter – delish!! Oh god, yum. I think I'm going to have a massive baking attack this week. Even the name of the place sounds wonderful. Elvis cupcake FTW. Elvis Cupcake . . . that's like the world's perfect combination. Ooo fun! Good to know that there is one good cupcake place in NYC…I haven't been that impressed with most of the ones I've tried! Butter Lane is glorious! Love your blog. I loooooove Butter Lane– one of my favorites. 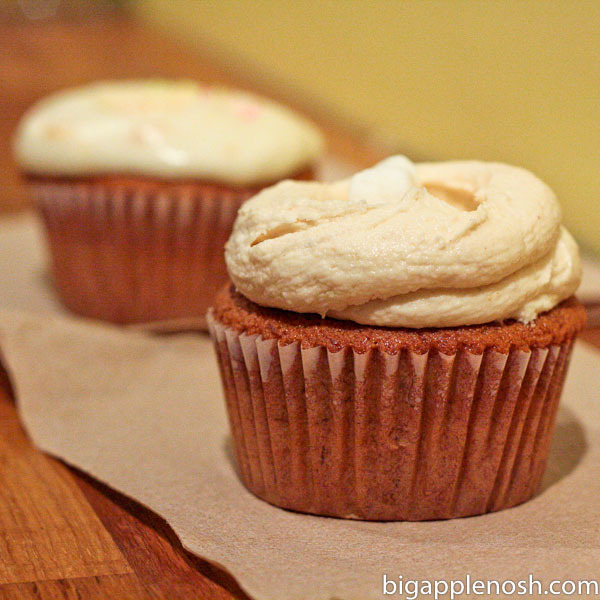 Have you tried Sugar Sweet Sunshine (126 Rivington) or Sweet Revenge (62 Carmine)? Sugar Sweet Sunshine has really cheap (but still delicious) cupcakes, and Sweet Revenge does a wine/beer pairing with their cupcakes. Isn't so strange how cupcakes have suddenly become this cultural phenomenon in New York City?